The green world of plants is the base of all life on the planet. Providing oxygen, nutrients and implicit in innumerable ecosystem services, we often fail to pay due respect and honor to the world of primary production. On “The Acre” plants have a place of utmost importance. About 2/3 of the property is predominantly wet meadow and allowed to naturalize with human manipulation playing a minimal role helping control alien invasives and propagating native species. Dealing with invasives can be daunting so “control” rather than eradication is the more realistic goal. For example, deflowering the majority of Purple Loosestife (Lythrum salicaria) before they go to seed helps keep them from spreading; they are notoriously difficult to uproot and given that the wet meadow receives a great deal of runoff, it is impossible to eliminate them. So interfering with their further propagation is far more practical. Natural succession is in process with the appearance of Red Osier Dogwood (Cornus stolonifera), Silky Dogwood (C. amomum) and Green Ash (Fraxinus pennsylvanica) sprinkled throughout the meadow. Curly/Yellow Dock (Rumex crispus), an alien, politely competes with native Common Boneset (Eupatorium perfoliatum) as some of the predominant herbaceous plants in the meadow with numerous Grasses, Sedges, Asters, Pinks and Sensitive Fern (Onoclea sensibilis) scattered throughout. On the higher, dryer end of the meadow, native White Spruce (Picea glauca) have been planted, along with White Pine (Pinus strobus) and Eastern Hemlock (Tsuga canadensis) creating bird habitat and Winter feeding opportunity for Red Squirrel and White-tailed Deer. The rest of the property, where possible, is little by little being turned over to garden beds for food, medicine and visual pleasure while also functioning to assist wildlife as much as possible. A 12 by 24 foot vegetable garden surrounded by herb beds is the major garden installation with a number of flower beds created throughout the rest of the “manicured” section. A mammoth Sugar Maple (Acer saccharum) provides the annual supply of maple syrup and a generous source of wild berries have appeared thanks to bird droppings and my personal disdain for trimming around trees. An old Apple tree makes a valiant effort to provide fruit each year in the dense shade of the Maple. The last of the dead Scot’s Pines still stands providing valuable Woodpecker sustenance while across the way, long ago planted Austrian (P. nigra) and White Pines provide excellent cover for the many songbirds that visit and live here. Below are posted some photos of plants that have been introduced around “The Acre.” They are part of a hypnotic, if not obsessive, pleasure that brings balance to not only the property’s environment but also to my own emotional, physical and spiritual well-being. All hail the Green! 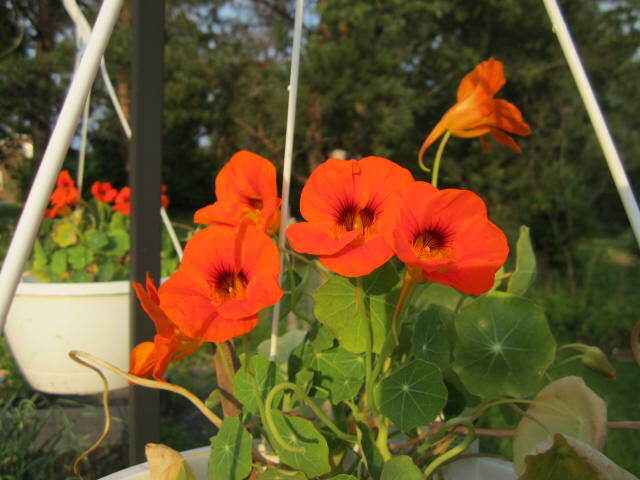 Nasturtiums hang in pots around the vegetable garden providing a lovely, peppery flavor to salads. 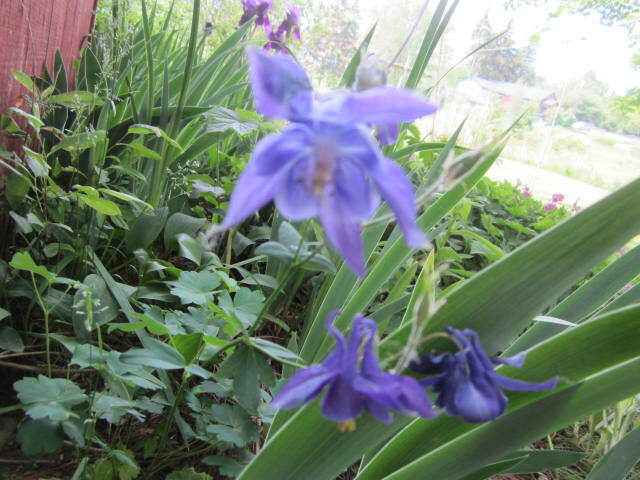 Lovely blue Columbines have naturalized all over the shady areas of “The Acre”. 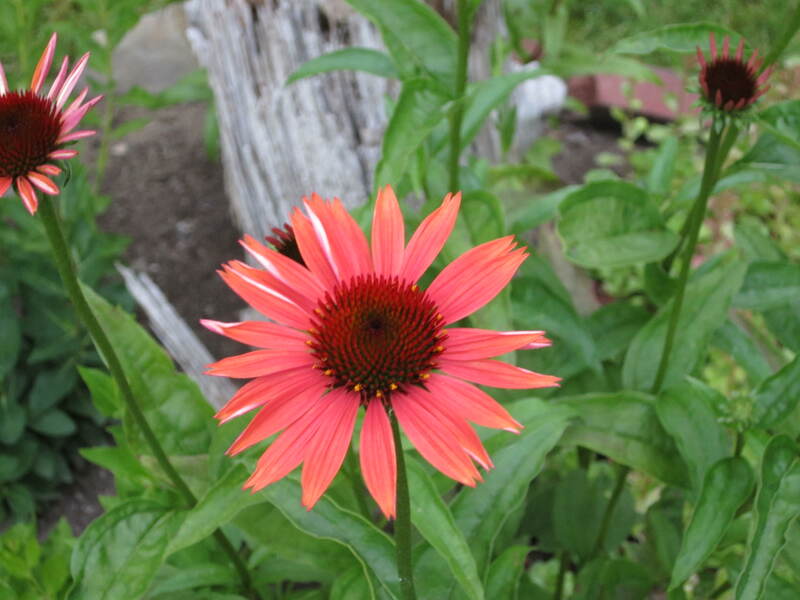 A bright orange variety of Echinacea stands out from the more common pink variety planted in other areas of the property. 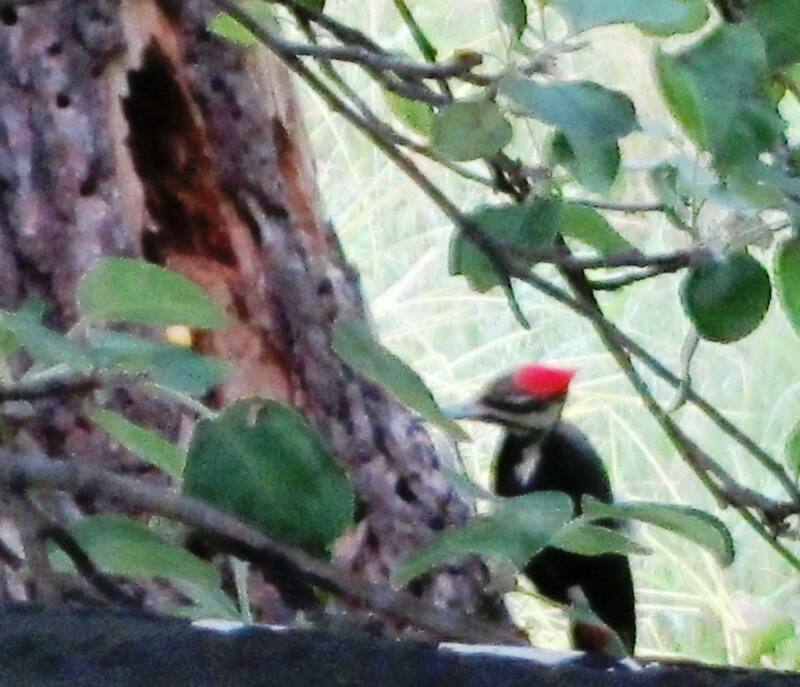 Leaving a dead Scot’s Pine snag standing brings the Pileated Woodpecker in for regular visits. 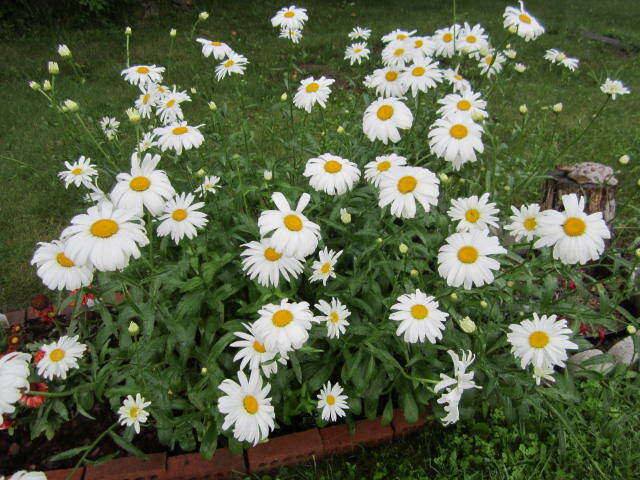 This bed of Shasta Daisies is full of happy smiling flowers. 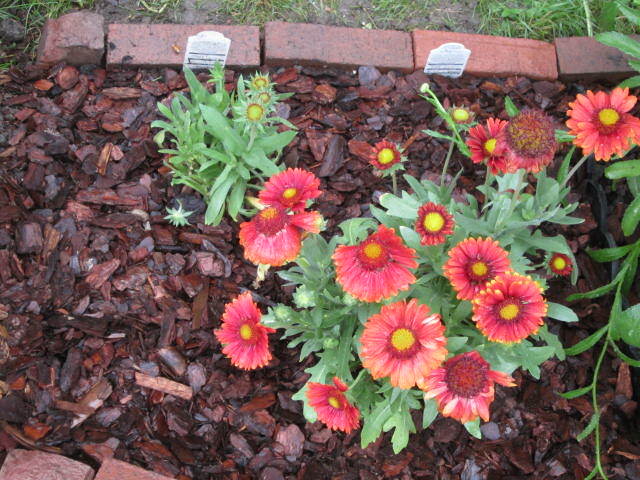 A new bed of Blanket Flowers has moved in next to the Shasta Daisies. 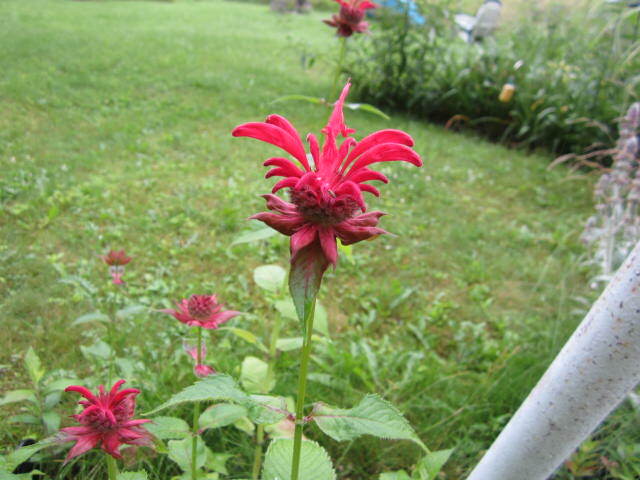 Monarda, aka Bee Balm, is a favorite among Ruby-throated Hummingbirds, a variety of Butterflies as well as the Bees. 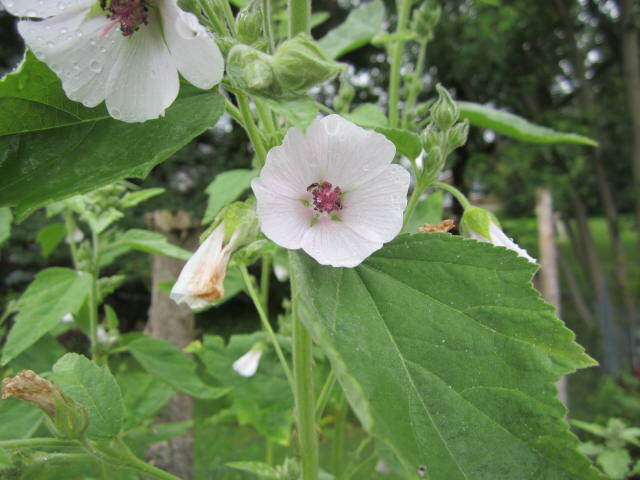 Ants are busy sipping nectar while pollinating these Marshmallows. 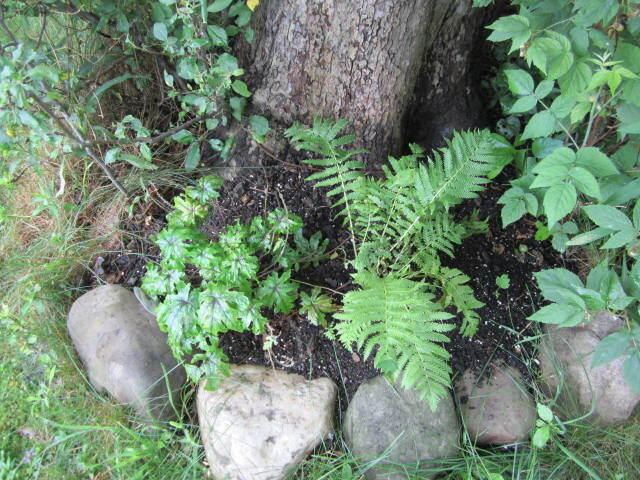 The base of trees is a perfect place for small beds of native Foam Flower and Ostrich Fern. 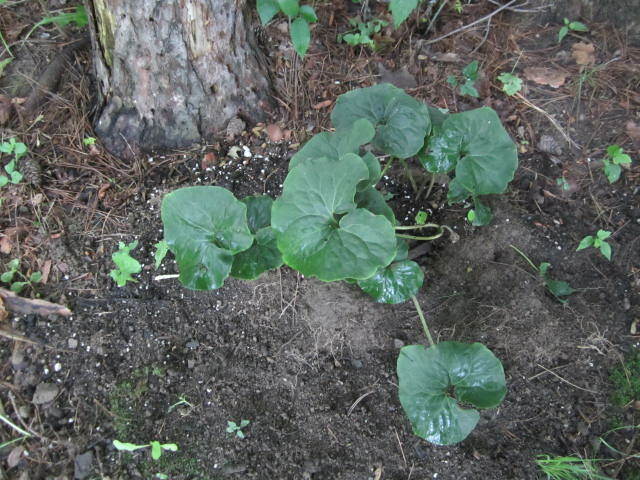 This new planting of Wild Ginger beneath the shade of the Pines is thus far doing quite well. 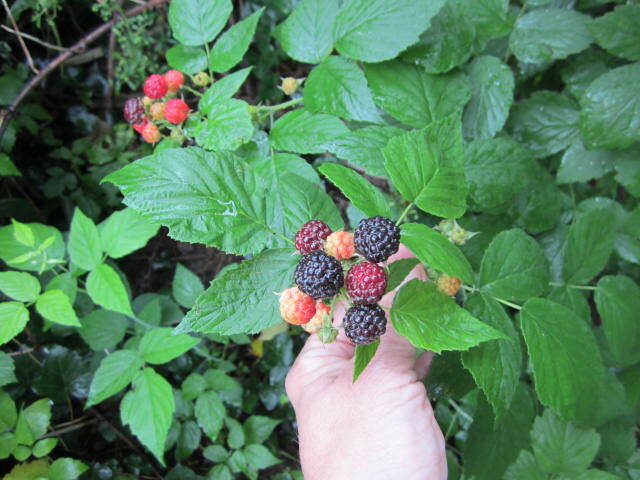 Much credit goes to the birds of “The Acre” whose droppings provide a wonderful supply of wild Black Raspberries. 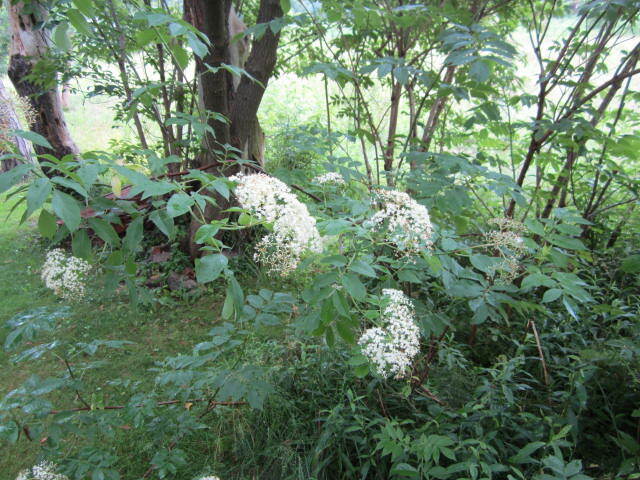 Among the most useful plantings are these beautiful Common Elderberries (Sambucus canadensis) which provide powerful medicine for humans and important bird food just in time for Autumn migration.